I’ve had a little down time since the last trip which has been very nice. I did an interview with WLBF, the flagship station on Faith Radio Network with Bob Crittendon when I got home. They are a great station in Montgomery, AL, and the network broadcasts across several states in the South. I’ve visited them before, and Bob is a great guy. I really appreciated his help in getting the word out about my new book, and we hope it will help so many families dealing with special needs, SPD, and autism. This past weekend I spoke and led worship for the women’s retreat for Grace Point Community Church in Lewis Center, OH. This has been a great church to work with, and they had the retreat at Cherry Valley Lodge which was great for me – it’s only 45 minutes from my house! It’s a rare treat to get to do local things, and finishing up a date and then going home is an amazing luxury! 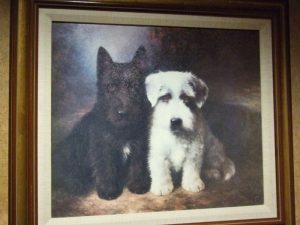 And, in a weird twist, the picture in the hallway outside my door was pretty much exactly my two dogs – had to share. I have two miniature schnauzers, one black and one light grey. Guess they were trying to make me feel at home. I had a wonderful time with the women. We talked about Esther and God was really moving and present there. The thing that touched me the most, though, were how many women sponsored World Vision children that weekend. 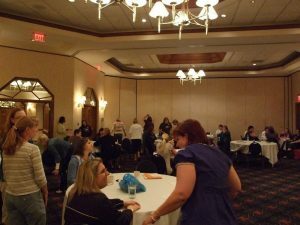 Almost 40% of the women there sponsored a World Vision child, and I was just blown away! This was not a particularly large retreat, and to have them step up that way just touched my heart. Helping children is such a passion for me, and I so appreciate these ladies!!! Thank you for being the hands of Jesus in the world. And, by the way, if any of you would ever like to sponsor a child through World Vision, there’s a link on my home page, or you can always email us for more information – info@jennifershaw.com – and we would love to answer any questions and set you up! You can save a life in Jesus’ name. Thanks! This entry was posted on Sunday, May 6th, 2012 at 9:48 pm	and is filed under News. You can follow any responses to this entry through the RSS 2.0 feed. You can leave a response, or trackback from your own site.